US #3376 from the US Navy Submarines Issue. Click image to order. 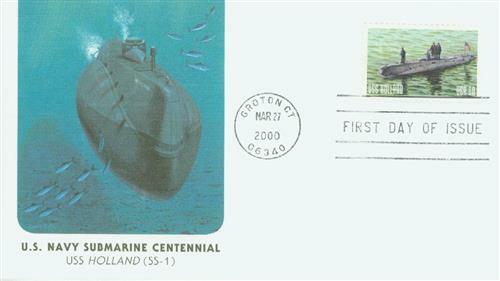 On April 11, 1900, the US Navy acquired the USS Holland, their first modern commissioned submarine. 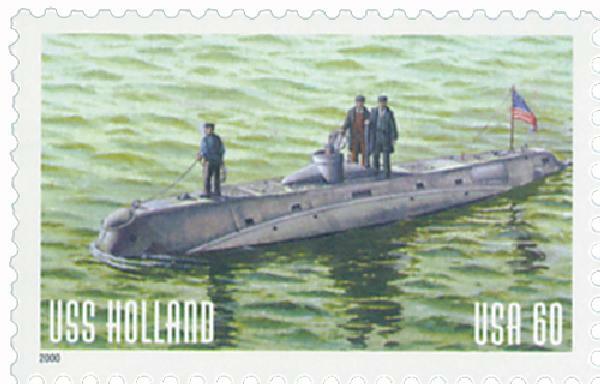 The Holland wasn’t the first submarine – submersible vessels had been in use for over a century, but the Holland was the first that had the power to remain submerged for a considerable distance. 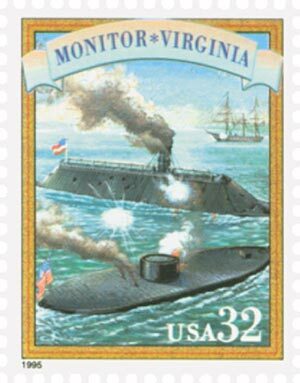 US #2975a from the 1995 Civil War issue. Click image to order. Irish-born John Philip Holland built the Holland. Holland became interested in submersibles while working as a teacher in Cork, Ireland. While reading about the battle of the Monitor and Merrimack during the American Civil War, he realized that the best way to defeat these ships would have been to attack from below the waterline. Soon he developed a design for a submersible, but was unable to obtain funding. Holland moved to the United States in 1873 and resumed work on his submarine design. Two years later, he submitted his plans to the US Navy, but they turned him down claiming it was unworkable. An Irish organization known as the Fenians believed in his work and funded his research so he could continue. In 1881, he produced a submarine for them, the Fenian Ram. However, they soon parted ways over a money issue. 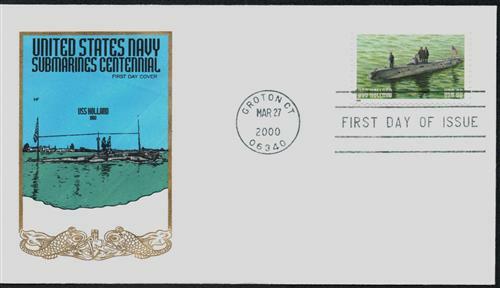 US #3376 – Fleetwood First Day Cover. Click image to order. Holland continued to improve his plans and built a series of experimental boats. On May 17, 1897, he launched what would become the USS Holland. It was the first submarine to combine electric motors for underwater travel with gasoline engines for moving along the surface. This made it the first submarine to be able to travel submerged for a significant amount of time. US #3376 – Silk Cachet First Day Cover. Click image to order. Having built the submarine and prove its effectiveness, Holland finally convinced the US Navy, and they purchased it on April 11, 1900 for $150,000. The Navy then put the vessel through months of rigorous testing before officially commissioning it as the USS Holland on October 12, 1900. The Navy then ordered six more submarines to be built based on Holland’s design. They would be known as the Plunger class and represented the nation’s first fleet of underwater vessels. The design would also be used by the Royal Navy and a similar version by the Imperial Japanese Navy. 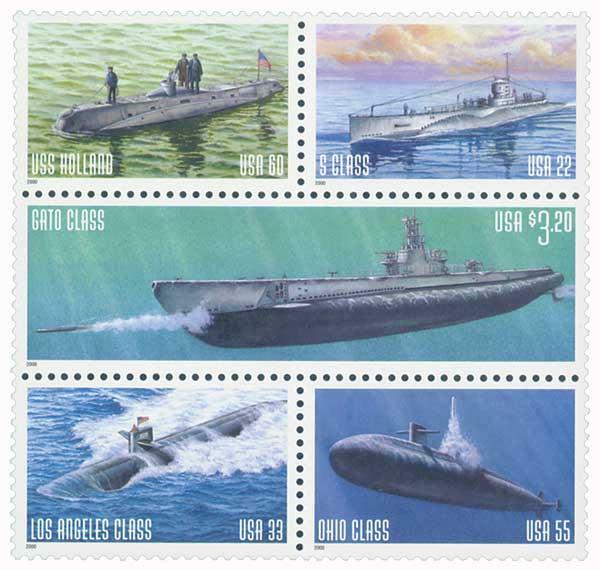 US #3373-77 – This set of five stamps was issued for the 100th anniversary of the US submarine fleet, which began with the USS Holland. Click image to order. Shortly after it’s commissioning, the Holland was brought to Maryland where it would be used to train midshipmen at the US Naval Academy. It was also used extensively to collect data for use in building newer submarines. The Holland spent its career in Annapolis training cadets. It was decommissioned in 1905 and removed from the naval register in 1910. The Holland was sold as scrap but placed on display for several years before being scrapped in 1932. 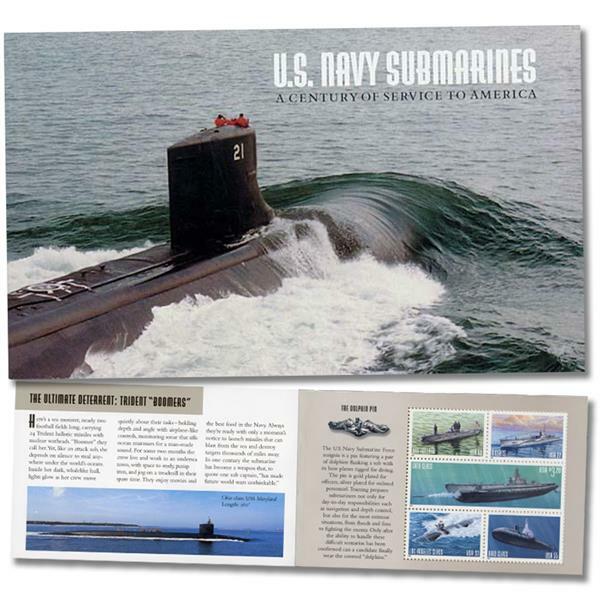 US #BK279 – America’s first prestige Booklet contains two panes of five stamps each, full-color photos of submarines, plus informative history. Click image to order. 3 Responses to "This Day in History… April 11, 1900"
Students at the U.S. Naval Academy are Midshipmen, not Cadets. You get it right in one sentence and then wrong in the next sentence. I wish they had not scraped iti. It would have been in the Smithsonian today!It was so small.It took a brave sailor to crew one of these. My nephew is an electrician for submarines in the Royal Canadian Navy. Thank you for the history of the submarine. My late husband was a submarine sailor during his commission in the late 50’s. I believe he was one of the crew of the Carbanaro, the spelling is mine. I just remember the name.